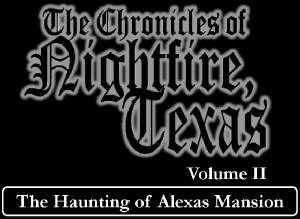 Eight months after the devastating series of killings dubbed "the Vampire Murders," the vampire Valen Alexas has managed to settle back into his old manor in Nighfire, Texas, vigilant to keep his secret from the little town's mortal residents. But the unquiet dead have other ideas. 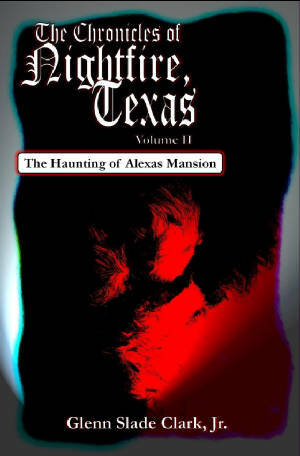 Teeming with the spirits of Valen's past victims, the old Alexas Mansion has been roused by its recent renovation, and one spirit in particular will not rest until the monster who killed her brother is destroyed. Forced to face the painful secrets that drove him from Nightfire decades before, Valen must now accept the reality that he cannot fight this vengeful, and perhaps hopelessly insane, spirit on his own. Before he can ever hope to survive this spirit's wrath, Valen will find himself embracing lost loves, reaching out to unlikely friends, and ultimately facing the terrifying fact that the only way to end the haunting of Alexas Mansion might be to join the malevolent spirit forever...on the other side.